What does elasticity have to do with poker? It sounds enjoyable. As usual, inelastic and elastic hands (more specifically ranges) are just the terms behind a concept that you've probably considered whilst in the middle of a session, or glossed over whilst reading other strategy articles. In this article, I will explain what these stretchy terms mean and how you can use an understanding of them to help you make more profitable bet sizes. What are elastic and inelastic hands? A player with an elastic hand will make their decision about whether or not to call based on the size of the bet. 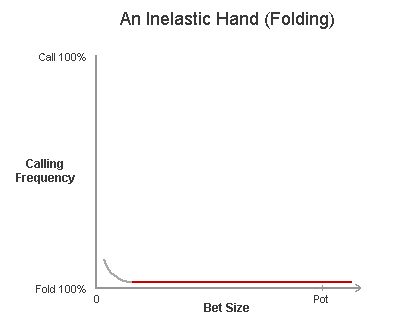 A player with an inelastic hand will either be calling or folding to virtually any sized bet. The size of the bet does not affect their decision on whether or not to call. The elasticity of a hand is determined by how much of an effect your bet size has on your opponent's decision to call. Note: For the following examples, assume that we are heads up and the hand has been checked to the river. In addition, our only options are to either call or fold. If our opponent bets between $3 and $5, we will call. If our opponent bets between $5 and $8, we may call or fold. If our opponent bets between $8 and $10, we will fold. This is an elastic hand because whether or not we call is influenced by the size of our opponent's bet. Our decision is flexible and it varies, so it's an elastic hand. A rough diagram to highlight the calling frequency of an elastic hand depending on the size of the bet. e.g. holding QT on a AQ852 board. If our opponent bets between $5 and $8, we will call. If our opponent bets between $8 and $10, we will call. 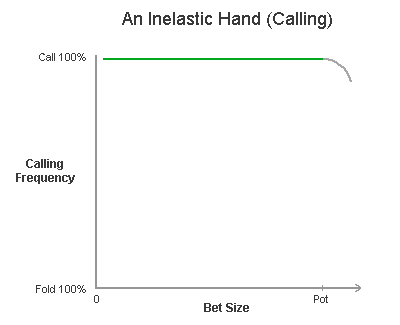 A rough diagram to highlight the calling frequency of an inelastic hand that is going to call regardless of the size of the bet. e.g. T9 on a TT844 board. Conversely, our decision would be the complete opposite if we have a slightly different hand on the same board. If our opponent bets between $3 and $5, we will fold. If our opponent bets between $5 and $8, we will fold. 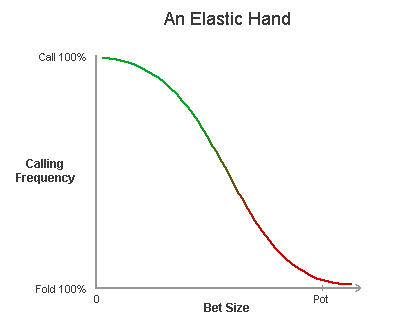 A rough diagram to highlight the calling frequency of an inelastic hand that is going to call regardless of the size of the bet. e.g. 56 on a TT844 board. These are inelastic hands because the size of our opponent's bet has no effect on our decision to call or fold. Our decision isn't flexible and it doesn't vary, so they are inelastic hands. If a range mostly consists of elastic hands, it's an elastic range. If a range mostly consists of inelastic hands, it's an inelastic range. How much do I mean when I say “mostly”? 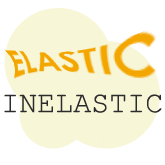 If a range is made up of at least 75% elastic or inelastic hands, you can safely call it an elastic or inelastic range. We prefer to work with ranges because it's unlikely that you're going to be able to put your opponent on one specific hand. So it's more useful to determine whether our opponent's range -- as opposed to hand -- is elastic or inelastic. Note: The degree of "elasticity" of a range will vary. Certain ranges can be more elastic or less elastic than others. In this article I'm looking at the ranges on each end of this scale. How to work out whether or not a range is elastic or inelastic. How do you know if a range consists of mostly one type of hand (e.g. 75%+ inelastic hands)? The fastest way is through intuition. If you have a lot of experience with putting opponents on ranges of hands it will be easy to say “I think they have an inelastic range in this spot”. It may not be perfectly accurate and it's not something every player will be able to do, but it is the quickest method. Alternatively, you could be more accurate by splitting your opponents range (the one you've assigned to them) in to elastic hands and inelastic hands. Using hand combinations you could then work out the percentage of each type of hand in that range. If there are more than 75% elastic hands, then you could call it an elastic range. How to play against an inelastic range. If you have a good hand, bet big. If you have a weak hand and you think your opponent will fold, bet small. Playing against an inelastic range is easy. All you have to remember is that your opponent already has a fixed decision in their mind, and your bet size is not going to have any effect on that decision. You can easily take advantage of an inelastic range by betting big with your strong hands (as your opponents will just as happily call a big bet as they would a small bet), and by betting small with your bluffs if you think your opponent will fold (as your opponents will just as happily fold to a small bet as they would to a big bet). A perfect example of exploiting an inelastic range is Zeebo's theorem. The theorem states that “No player is capable of folding a full house on any betting round, regardless of the size of the bet.” So if you're betting half-pot when your opponent could well have a full-house in their range, you are severely missing out on value. Playing against an inelastic ranges diagrams. A rough diagram to show good and poor bet sizes if your opponent has an inelastic range and you want them to fold. If your opponent has an inelastic range and you want them to fold, you should bet small. If you bet big your are risking more than you need to when a smaller bet will achieve the same result. The smaller you can bet when you want your opponent to fold their inelastic range -- whilst still achieving a high fold frequency -- the better. A rough diagram to show good and poor bet sizes if your opponent has an inelastic range and you want them to call. If your opponent has an inelastic range and you want them to call, you should bet big. If you bet small you are missing out on value due to the fact that your opponent is just as likely to call a small bet as they are a big bet. The bigger you can bet when you want your opponent to call with their inelastic range -- whilst still achieving a high call frequency -- the better. Note: Not all inelastic ranges are going to either call or fold 100% of the time for any bet size. I've accounted for this with the grey areas at the extremes of each diagram above. Playing against an inelastic range example. Here's a basic and common example: we are in position against a half-decent opponent that doesn't know what floating is. Strong hands that will call. Big pairs (e.g. AQ), overpairs (KK+), mid-pocket pairs (e.g. TT), sets, two pair, and middle pair hands (e.g. A7). Weak hands that will fold. Everything else. 1) If our opponent has a strong hand like top pair or better, they are going to comfortably call any size bet on this flop. For the most part, they are going to be just as happy to call a pot-size bet as they would be to call a half-pot size bet. 2) Any other hand on this flop would be considered weak. If our opponent has any other hand like a pair of 2s or a low pocket pair (these are the at the top of their "weak range"), they cannot comfortably call a bet. They are equally as likely to fold to a half-pot bet as they would to a pot-size bet. There are virtually no hands in our opponent's range on this flop that will call a half-pot bet, but fold to a pot-size bet. If we plan on making a continuation bet bluff with a hand like AK, we should bet small -- around $6. A half-pot size bet will achieve the same result as a pot-size bet, so we should bet small to minimize our losses when our opponent does have a hand worth calling with. How to play against an elastic range. If you have a good hand, you should bet small enough so that worse hands than yours can call (for thin value). If you have a weak hand and you think your opponent will fold, you should bet just big enough so that stronger hands will fold. If you know that your opponent has an elastic range, you should vary your bet sizes depending on what you want to achieve. If you want to entice your opponent to call, you should lean toward betting a small amount. If you want your opponent to fold, you should look toward betting big. Playing against an elastic range is a lot more difficult than playing against an inelastic range. Against an elastic range you need to tailor your bet sizes appropriately, which requires more skill than simply choosing either end of the scale (i.e. bet big or bet small) as you would against an inelastic range. Playing against an elastic range diagram. You have to tailor your bet sizes when playing against an elastic range if you to get the most value. If you have a decent hand and your opponent has an elastic calling range, you want to size your bet so that only worse hands will call. If you size your bet too big, you will only get calls from hands that are better than yours. If you size your bet too small, you will miss out on value from hands that are only slightly worse than yours. Playing against an elastic range example. Seeing as we want to get value from weaker hands than ours, a big bet ($30) isn't a great option. If we make a big bet on this turn we are forcing out hands that we would get value from, such has weaker Jx hands and most draws. Our bet size is only attractive to the parts of our opponent's range that have us beat, such as two-pair hands or better. Conversely, if we make a smallish bet ($18 sounds good), we will bet getting calls from the parts of our opponent's range that we will get value from. More one-pair hands are more likely to call, and so are flush and straight draws -- which we have good equity against. Note: I'm sure some of you will be screaming "but don't we want drawing hands to fold?" Not really, because they are still getting bad pot odds with our $18 bet. They are getting 2.7 to 1, when they ideally need just over 4 to 1. If they call with bad pot odds, we profit. Elastic and inelastic hands evaluation. Inelastic ranges: If you have a good hand,t, bet big. Elastic ranges: If you have a decent hand, only bet enough so that worse hands will call. With inelastic ranges, bet sizes do not matter. With elastic ranges, bet sizes matter. Inelastic ranges are easy, because it's mostly about betting big and maximizing value when you have a good hand. Elastic ranges are trickier, because you have to tailor your bet sizes to extract as much value as possible, whilst not betting so much that only better hands will call. As a beginner player, understanding and being able to take advantage of inelastic ranges is the most valuable thing you could take from this article. Exploiting elastic ranges is something that takes a lot of skill in an attempt to gain smaller profits, and is something that experienced players will want to work on refining.